Carry the essentials in this great wallet. Our trifold wallet is a great 'must have' accessory. It's made completely in one hooping on your embroidery machine. 5x7 - 4.99" x 6.98"
6x10 - 6" x 9.12"
7x12 - 6.98" x 11.64"
8x12 - 7.55" x 11.33"
(5x7) It features stipple quilting on the flap, outside and zippered pocket. (5x7) There are 2 credit card slots. The quilted zippered pocket can hold folded cash. (5x7) The pocket is fully lined and has no exposed seams inside. (6x10) It features stipple quilting on the flap, outside and zippered pocket. (6x10) There are 4 credit card slots. The quilted zippered pocket can hold folded cash. (6x10) The pocket is fully lined and has no exposed seams inside. The flap is made first in the hoop, then it's stitched on while the wallet is being made. 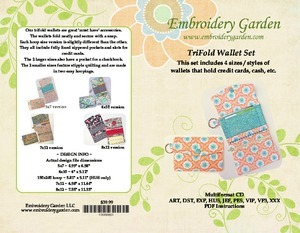 A stipple quilting file is included for the outside of the wallet. 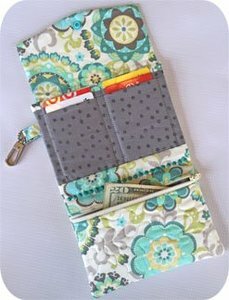 (7x12) This wallet features 4 credit card pockets going vertically. 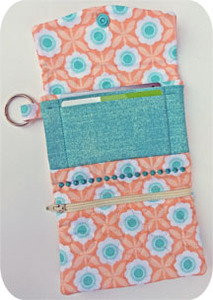 (7x12) Zippered pocket and a pocket for a checkbook or paper money. 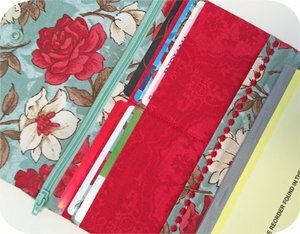 (7x12) The zippered pocket is fully lined and has no exposed seams inside. 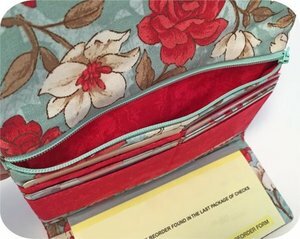 (7x12) Our wallet folds neatly and secures with a snap. 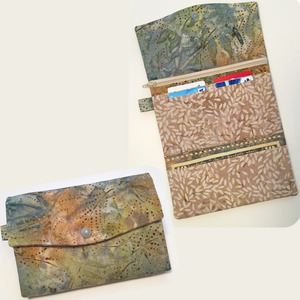 (8x12) The wallet features 6 credit card pockets, a zippered pocket and a pocket for a checkbook, phone (an iPhone 6 in a slim case fits) or paper money. 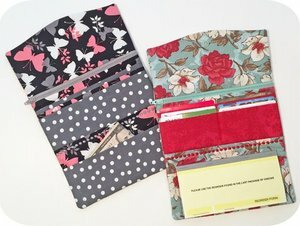 (8x12) Our wallet folds neatly and secures with a snap. 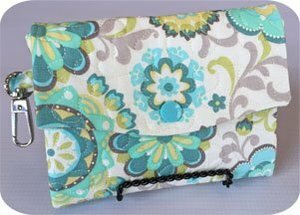 (8x12) The zippered pocket is fully lined and has no exposed seams inside.